I managed to see Avatar, District 9, An Education, A Serious Man, Up, and Up in the Air. I would really like to view The Hurt Locker and probably The Blind Side. I think Precious would be too bleak and Inglourious Bastards too bloody, but you never know. I thought Julie and Julia might have made the list. I have commented before that I love movies that have a strong narrative, in part because the best of the bible and life in general is story-telling. Religion breaks down when we lose the narrative quality which conveys its truths. The bible narratives are often startlingly honest about the human condition. Which movies did you enjoy the most from this list, and which would you like to see? Any theological insights? Up was fantastic. Since I saw it on my birthday last year, I've began using it at school as a compliment to my lit. studies. The others ones I have yet to hit! I enjoyed all of these movies. I haven't seen "Precious" and I am not likely to see it. "Inglourious Basterds",was good,wasn't too bloody. I think the race will be between "The Hurt Locker" and "Avatar". "A Serious Man" was one of my favourites. I was surprised to see "The Blind Side" up for best picture, I don't think it was all that good, enjoyable but forgettable. I vote for Up....and the best actor award should go to "Kevin", the creature that tags along with them! He(actually it was a she) had me laughing hysterically. I still make that hissing sound at my daughter once in a while. I'm not sure she finds it as funny as I do! 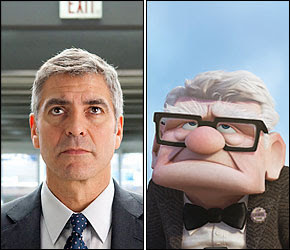 My second vote goes for Up in the Air - well acted, and for once, a movie that didn't have a happy ending. Only saw The Blind Side (thought Sandra Bullock quite good, probably not Best Picture material though) and UP which I love. And I'd have to vote for Doug (the dog) for most memorable character. (Today is a good day. )Although Avitar not my normal genre...will try to catch it as have heard so much good about it. Interesting that all five of us enjoyed Up. That scene where grumpy old Carl's life scurries past is so moving, one of the best vignettes in any movie from last year. Anyway, I saw three of them: The Blind Side, Up, and Avatar. Avatar was great for the special effects and all, but I found it to be a story that is told often, and this one not even as good as most. The Blind Side was good, but an Oscar? I also really enjoyed Up. I think Doug was also a favourite for me. I look forward to seeing some of the other ones, but I see most of my movies on DVD now, so I'm waiting.